Have you heard the rumors that Puerto Vallarta has a hidden beach that you can only access during low tide? The rumors are true! Playa del Amor, better known as the Hidden Beach or Lover’s Beach, is a feature of one of the Marieta Islands which is located west of Puerto Vallarta on the outskirts of Banderas Bay. The Marietas islands were originally formed thousands of years ago due to volcanic activity in the area. Large volcanic explosions took place on the islands which caused the creation of caves and unique rock formations. While uninhabited by human life, there is a wide variety of marine life and wildlife that make this hidden beach their home. 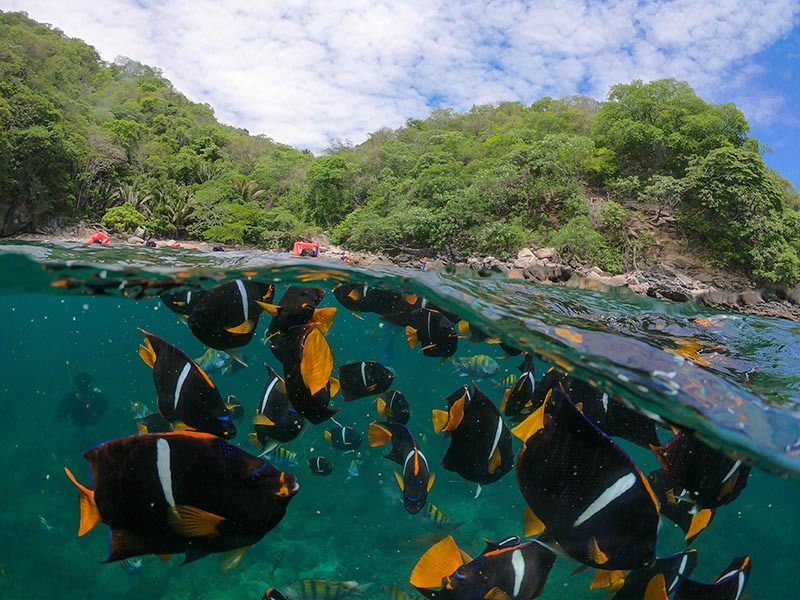 When you arrive to Puerto Vallarta’s hidden beach, you will hardly believe your eyes. The hidden beach truly is the stuff that dreams are made of… a wide, sandy cavern with the Pacific Ocean’s crystal clear waters lapping on the beach. 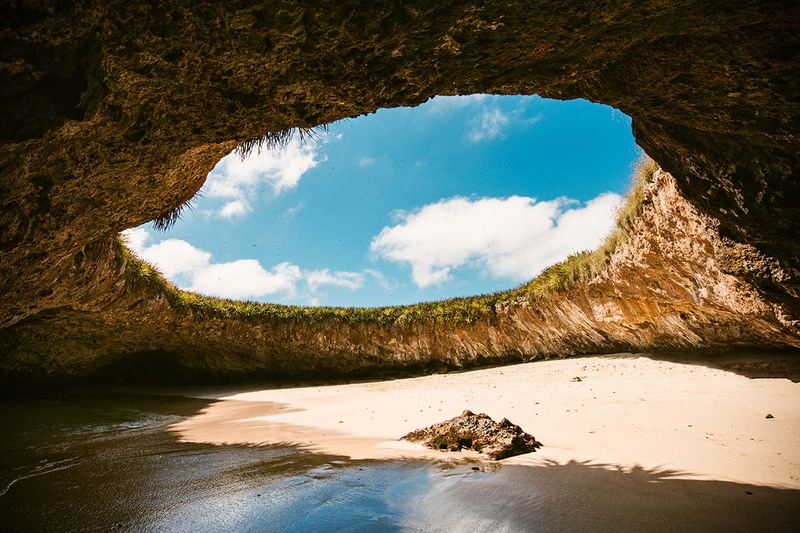 This hidden beach is without a doubt one of the most beautiful and ecologically-diverse hidden beaches in all of Mexico. A perfect spot to snorkel and admire the colorful marine life that inhabits the area, the hidden beach is also a great place for romance and reflection. Lay down on its sandy beaches and gaze above at the beautiful blue clear skies that peek in from amongst the cavern’s ceiling and soak in the warm Puerto Vallarta sunshine. While there is no man made structures on the island, you will be surprised to learn that more than 100 species of unique birds and fish inhabit the area. If you find yourself visiting the hidden beach between December and April, you will likely be lucky enough to see humpback whales that pass through the area during these months on your way to and from the hidden beach. Humpback whales migrate each year down from the icy, cold waters of Alaska to procreate and birth their young in the warm, sheltered waters of Banderas Bay. Banderas Bay is lucky to get a lot of whale activity during these months, and you are virtually guaranteed a whale sighting when you travel between the mainland the Marietas Islands. Watch for the enchanting humpback whales as they jump high out of the water, and enjoy their playful side as they flap their fins or spray water high in the air from their breathing hole. 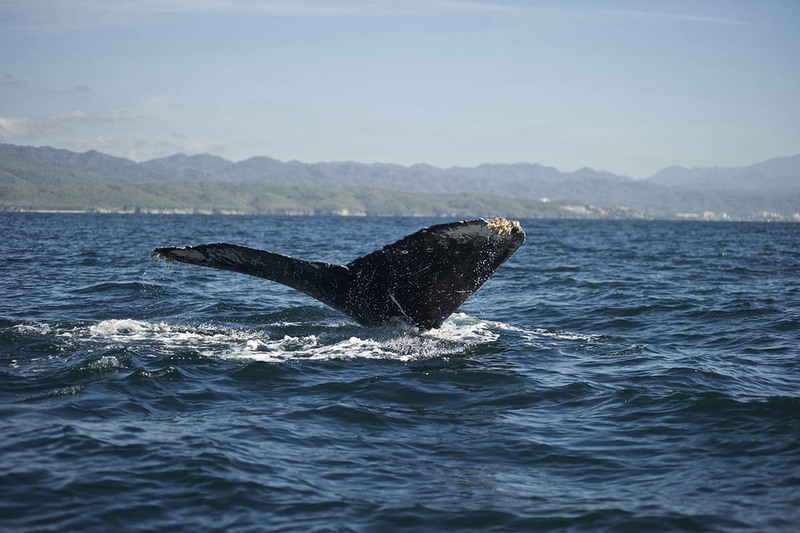 As it is mating season, you will without a doubt see young baby whales staying close to the protective mother as they enjoy the Puerto Vallarta weather. It is hard to beat the feeling of coming so close to one of nature’s most beautiful and majestic creatures. Next time you find yourself in Puerto Vallarta, make sure to visit the hidden beach or Lover’s Beach for an unique and unforgettable experience. Many tour companies offer packages to visit the hidden beach, and you can ask the front desk concierge if you need assistance in booking a tour.